In our biggest year yet, DFA members were critical in Senate victories for Elizabeth Warren, Tammy Baldwin, Mazie Hirono, and Martin Heinrich. These four Senators and eight additional House progressives, including Annie Kuster, Carol Shea Porter and Raul Ruiz, were chosen for DFA's highest endorsement: the Dean Dozen. 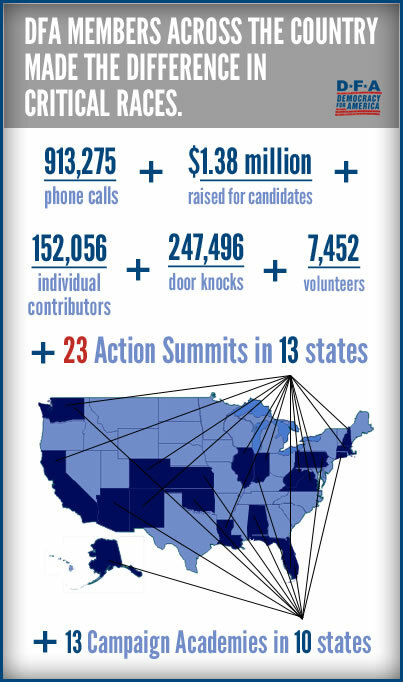 In 2012, Dean Dozen candidates received more than $600,000 from 12,000 DFA members, thousands of volunteers hours, door knocks and calls, training on the ground and online, media-generating polling, message testing and strategic campaign planning.